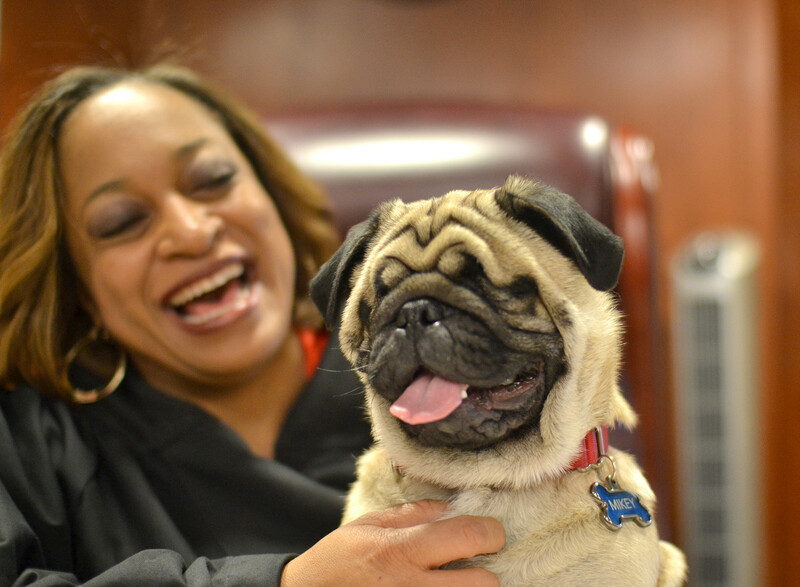 When Mikey the pug arrived at the Michigan Humane Society in November, he was suffering from demodectic mange and glaucoma. The latter condition had left him blind and in serious pain. A lot has changed in eight months. All images courtesy of the Michigan Humane Society. MHS veterinarians decided that Mikey would need his eyes removed for his comfort and health, and he underwent surgery shortly after he was rescued. 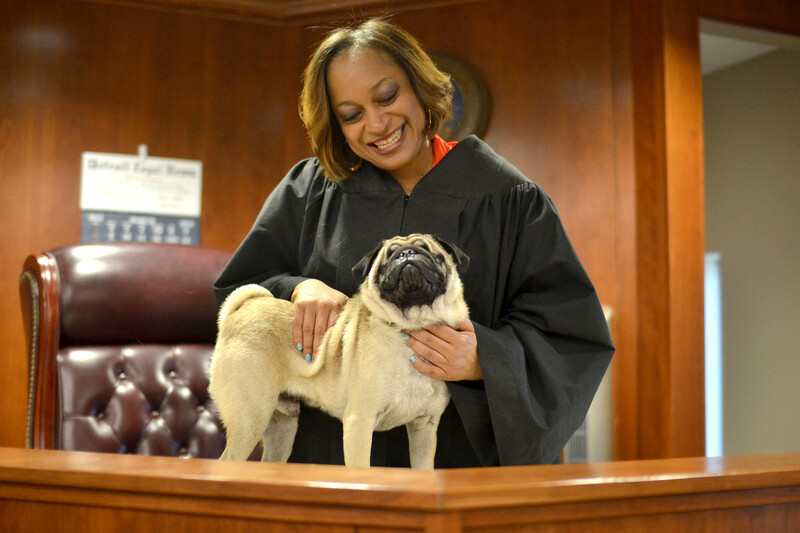 In March, with the help of Michigan Pug Rescue, he found a new home with Sabrina Johnson, the district judge for Inkster, Michigan. Mikey is now 2 years old and fully recovered. Mikey usually needs a little time to familiarize himself with new environments, but he's a fast learner and rarely bumps into things, Johnson said in a video released Monday by MHS. If he does have a setback, though, he isn't fazed. Johnson says she's learned a thing or two from seeing Mikey in action. Mikey and Johnson seem like a perfectly matched pair, even enjoying similar hobbies. "He loves to run, he loves to eat and he loves to relax. So he's a lot like me," Johnson said. The pug has also made friends at Johnson's work (and learned all of the proper procedures). In her work, Johnson regularly deals with serious cases. Fortunately, it's clear that Mikey is brightening her days, too. Dudley is a 1.5-year-old American bulldog mix who has the heart and energy of a puppy. He approaches every moment of life with joy and enthusiasm. He is beyond affectionate and will nudge up against his handler just for extra love and snuggles. Dudley needs some training and some guidance (come on, what 1-year old doesn’t? ), but has an amazing personality, is completely lovable, and would be your best friend for life. In the time he has been at the shelter he has already made huge steps in his training. Dudley is quite the smartypants and is a fast learner! He loves training just as much as he loves playing. Due to Dudley’s high energy he needs to be in a home with no children, but is social and playful with other dogs! Dudley is pure love and would be your best bud for life! If you would like to know more, please contact the Town of Hempstead Animal Shelter at (516) 785-5220 or <a href="http://www.toh.li/animal-shelter" target="_blank">check out their website</a>. They are located at 3320 Beltagh Avenue, Wantagh, NY 11793.